I realised something a little frightening earlier its ten years ago this month I started the course that changed me from an engineer into a web developer. I’d used the WWW and e-mail as a student but not made any web pages before. 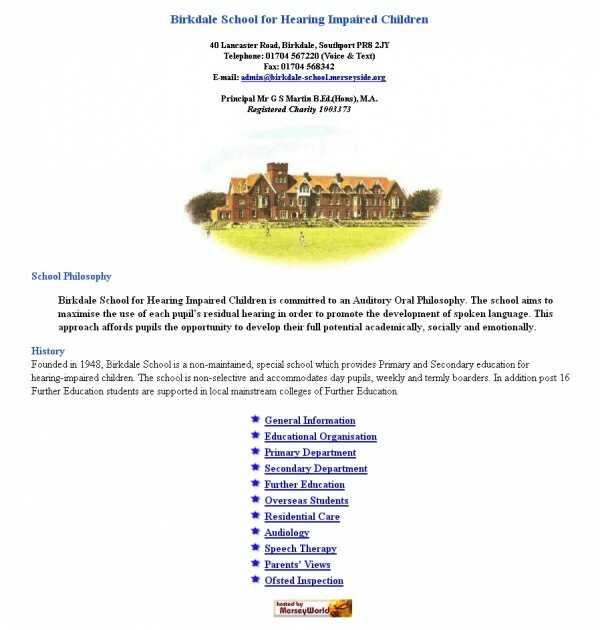 It wasn’t till January the next year that I began working as a web developer and made the site below for Birkdale School for the Hearing Impaired. I remember making the little star bullet points a pixel at a time in a rather unforgiving Unix paint package. I read an article the other day about a shortage of home grown engineers in the UK. Apparently I wasn’t alone in switching professions back in the mid nineties when new graduates weren’t being taken on by companies. Ten years on the professional bodies have realised Bit late now to realise that that’s what would happen. Their plan to encourage new entrants to the field: giving money to writers to feature engineers in plays, films and TV shows. So all I need to do now is figure out how to write a drama with an engineer who isn’t a bitter, cynical and underpaid. I think it will take a better writer than I’ll ever be to do that.